2 or more: $142.49 ea. 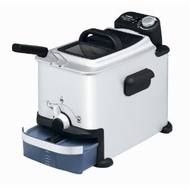 The professional style Ultimate EZ Clean Pro Fryer is truly the ultimate deep fryer. This high wattage unit, 1700 watts, boasts an extra large food capacity of 2.65 lbs. and a stylish stainless steel exterior. This unit also is equipped with a patented automatic oil drainage and filtration system which allows the user to never touch the oil! The unit is entirely dishwasher safe which makes for super easy clean-up. This unit also comes equipped with a large viewing window, external frying basket control, a permanent odor filter and an adjustable thermostat.